View More In Crepe Pans. Making crepes has never been so quick and easy. Simply plug the crepe maker in to let it heat up, spread a thin layer of batter and watch it cooks in seconds. Our electric Griddle and Crepe maker has a 12 inch diameter surface, ideal for traditional French crepes. Features a non-stick aluminum plate and 5 different temperature settings. Batter spreader included. 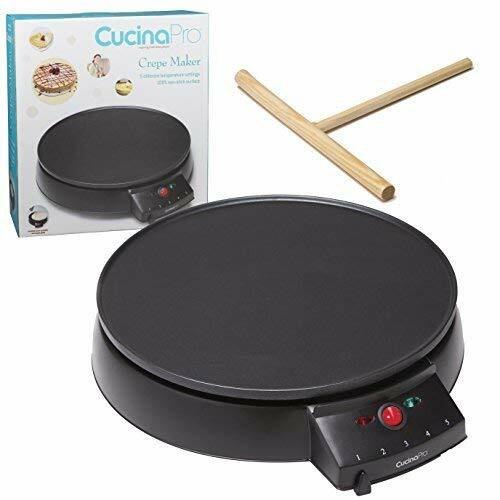 Delicate crepes and blintzes are made quickly and easily on this 12" non-stick crepe maker and griddle. Five different temperature settings, you'll have precise control for perfect results. The batter spreader, which is an important part of making super-thin crepes, is included. The aluminum plate is also ideal for using as a griddle, perfect for making stacks of pancakes, bacon and other breakfast favorites. The On/Off ready light lets you know when the plate is hot enough. Rubber feet for extra stability. Includes recipes for basic crepe batter, fresh mushroom crepes, and blueberry blintzes. If you have any questions about this product by CucinaPro, contact us by completing and submitting the form below. If you are looking for a specif part number, please include it with your message.